Send this nicely presented gift of Cheerful Summer Delight 12 Rose Bouquet in a Vase and let someone know that you have feelings for him/her. 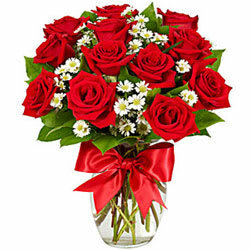 These 12 Red Roses Bouquet are designed with Fillers Flowers and presented in a Vase. Delight your loved ones with this Breathtaking Reflection of Love Floral Bunch in a Vase and make them realize how special they mean to you. Send your most romantic intentions to your sweetheart no matter the distance with these 18 Red Roses added with Fillers Flowers in a Vase. Delight your loved ones with this Breathtaking Reflection of Love Floral Bunch in a Vase and make them realize how special they mean to you. Send your most romantic intentions to your sweetheart no matter the distance with these 24 Red Roses added with Fillers Flowers in a Vase.